With great fanfare we declare our brewery member’s club open for 2019! Following on from our tasting room redevelopment, the next phase is the launch of our Brewery Member’s Club which gives you discounts and access to events at our brewery and elsewhere, along with an invite to the official opening party on May 25th. 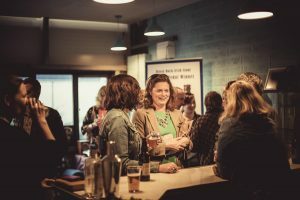 Join our Member’s Club to become part of the gang here and share in our special events taking place in the brewery throughout the summer. Brewery Tour and Tasting for Six People. Bring your friends or come again and again! It’s quite simple – fill in your details and let us take care of the rest! On purchase we’ll drop you a welcome email, then get your welcome pack posted out to you. 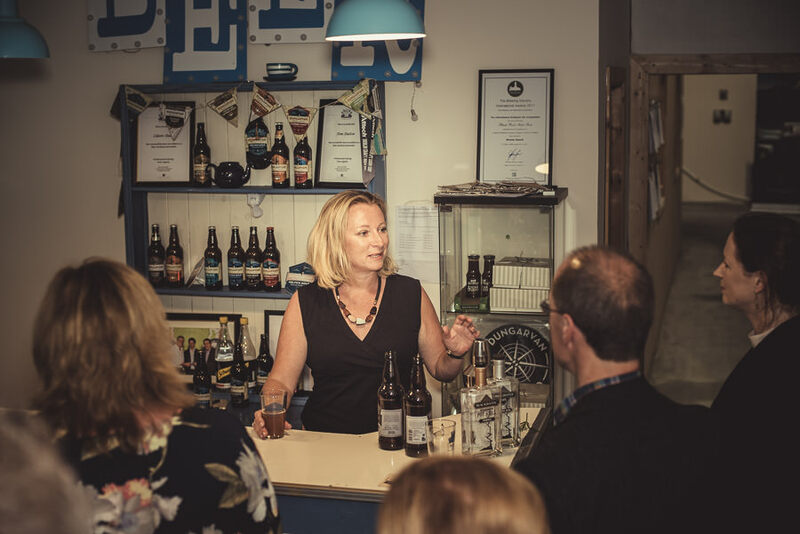 You’ll be supplied with discount codes to book tours, events and merchandise either at the brewery or through our online shop and we’ll confirm your place at our open day event in May. Having received everything, it’s in your hands to book your six tour places at a date that suits you, and you’ll receive a monthly newsletter from us with details of upcoming events both at the brewery and around the country where you can get booking discount or an exclusive invite, depending on the the event. If you’ve any queries drop us a line and we’ll do our best to answer them! 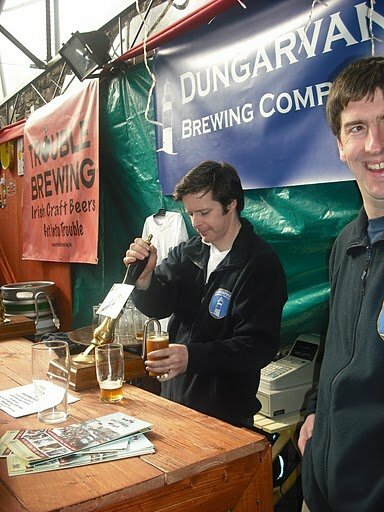 On April 9th 2010 we gathered in The Tannery for the launch of our brewery, followed up with a party for friends in Downey’s Bar in Dungarvan and first pours of our range. What a nine years that has been! From an initial core range of three beers, we started adding seasonals beginning with our Coffee and Oatmeal Stout in 2011 and many one-off brews and festival specials. Nine years later our core range has grown to five, with regular seasonals and small batch releases. Added to this is our Greenway Pale Ale, released in 2018 and this year’s batch currently on release. Next to be added to the line up is an alcohol free beer, which is scheduled for release at the end of this month. 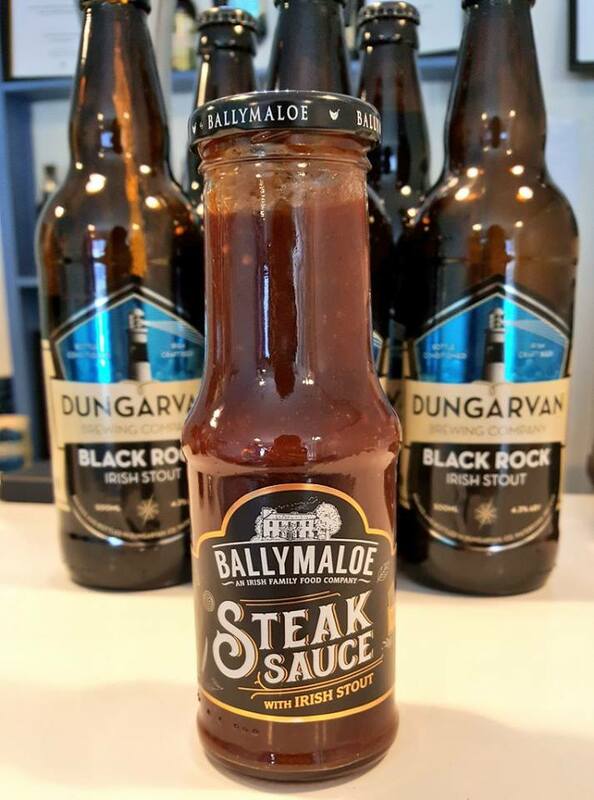 We’ve gone from hand bottling to semi automation, and seeing the craft brewing world grow from just seven microbreweries in Ireland when we started to upwards of seventy now. 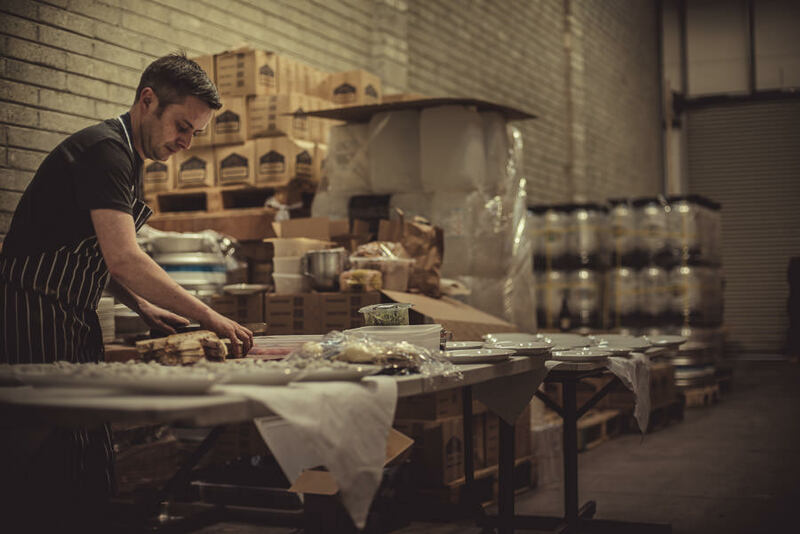 Our own brewery has changed and developed, along with the market and the Irish craft beer scene as a whole. Our first outing at Easterfest 2010. Sharing noobs corner with Trouble Brewing. 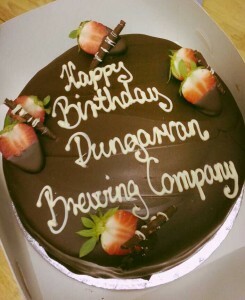 Throughout our journey we have made so many new friends in the brewing and food world in Ireland and beyond. 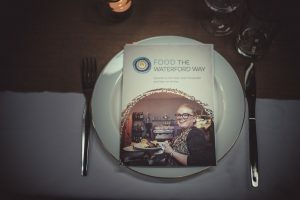 We’ve enjoyed festivals, tastings and collaborations, hosted tours and held long table dinners at the brewery, worked with many local producers and are proud members of Food The Waterford Way which promotes collaboration within the Waterford food and drinks scene. 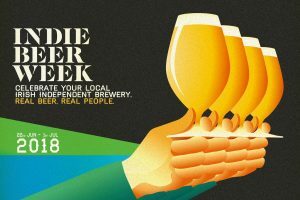 We are founder members of the Independent Craft Brewers of Ireland, a group which has campaigned hard on behalf of the small breweries of Ireland as well as promoting Irish craft beer through Indie Beer Week and the Independent Irish Craft Beer symbol. Since the start of this year we have been working hard on developing our tours side of the business. 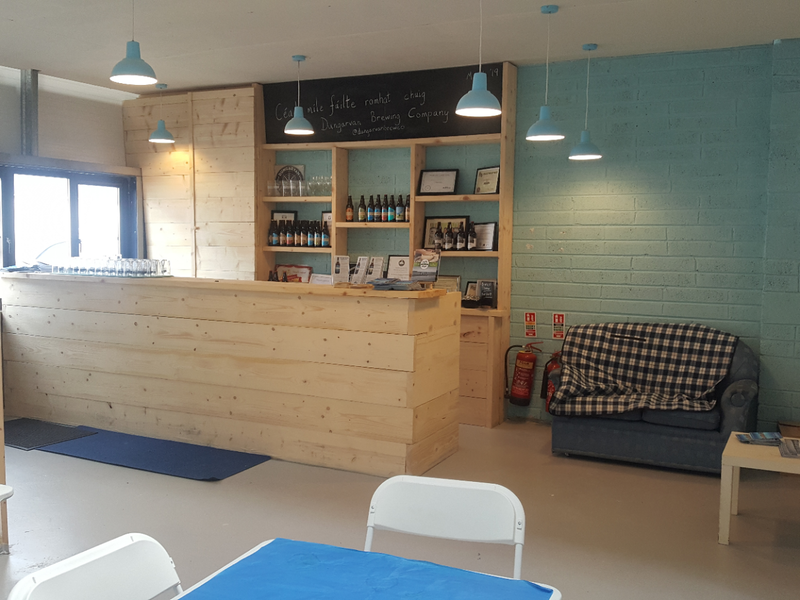 Alongside our brand new website, we’ve completely rebuilt our tasting room. As a result, we can now accommodate groups of up to 35 and plan on opening up a lot more to visitors this year. 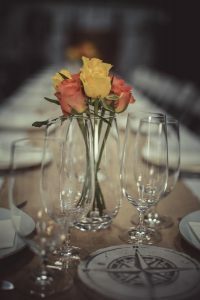 From an ad-hoc offering we now offer regularly scheduled tours throughout the summer, on Wednesdays and Fridays, and have plans to add more specialist events to our calendar. As well as continuing to produce great beers, we will be further developing this side of the business and are set to announce plans for our Members Club, which will be launched in the coming days. So thanks to everyone for being with us along the way, and we hope you join us in raising a glass for our ninth birthday – and come with us as we enter our next phase. 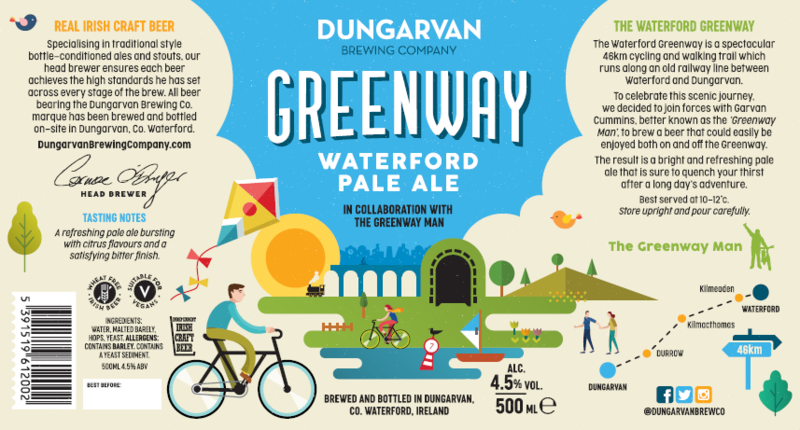 Celebrating the Waterford Greenway, we are delighted to announce the 2019 launch of our Greenway Waterford Pale Ale. First launched in the summer of 2018 in collaboration with The Greenway Man, this refreshing beer has been generously hopped with Simcoe, Citra and Amarillo to give a lively citrus flavour which we think is the perfect restorative beer after a (long or short!) trek on our coastal route. The Waterford Greenway opened in 2017 and is a 46km scenic coastal walking and cycling rail along the old railway line from Waterford to Dungarvan. Sandwiched between the Comeragh Mountains and the Copper Coast, it hosts unparalleled views and wonderful features such as the Durrow Tunnel, Ballyvoile Viaduct and Mount Congreve Gardens. In its two years, the Greenway has become an enormous attraction to the area, with both locals and visitors enjoying spending time walking or cycling sections of it. We wanted to celebrate this and were delighted when Garvan and Emmet approached us about doing something together. We all agreed that we wanted to develop a beer that would be refreshing and flavoursome, with a summery feel to it. The result was our Greenway Pale Ale, which after an initial batch had to be quickly restocked last summer. Following a brief winter hiatus, it is now back in full time production for the 2019 season, released in mid March and available throughout the county and further afield. 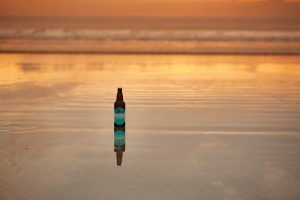 So plan your trip with a bottle or pint to finish up with for this summer! 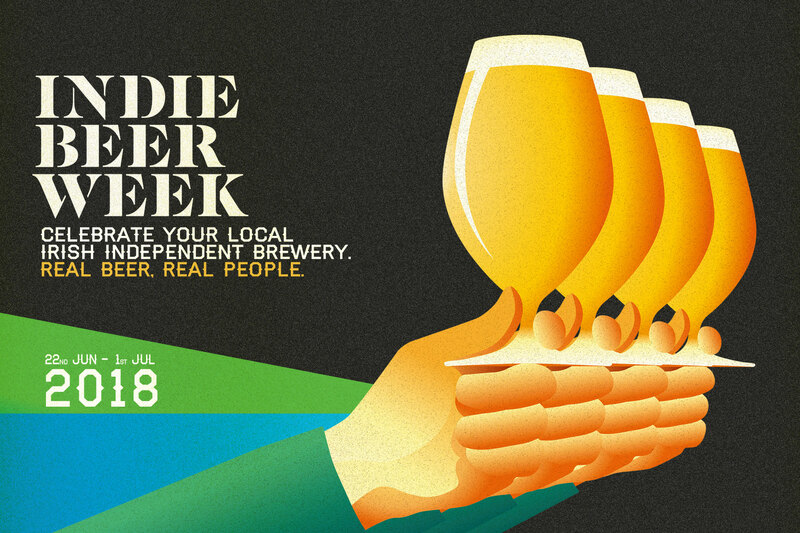 More details on this and all of our beers here. Photography by Pawel Lorenc, ‘I do’ Photography. Last Friday we were delighted to host our first dining event at the brewery, a long table dinner in which we showcased West Waterford produce as part of the Waterford Way series of food events taking place throughout the summer. Chef Shane McGrath of the Cliff House Hotel put together a showstopping six course tasting menu featuring delights such as Harty’s Oysters, Grantstown Tomatoes, Seagull Bakery breads, local lobster, halibut and monkfish, Ardmore carrots, Little Milk Company cheese, local strawberries and more. 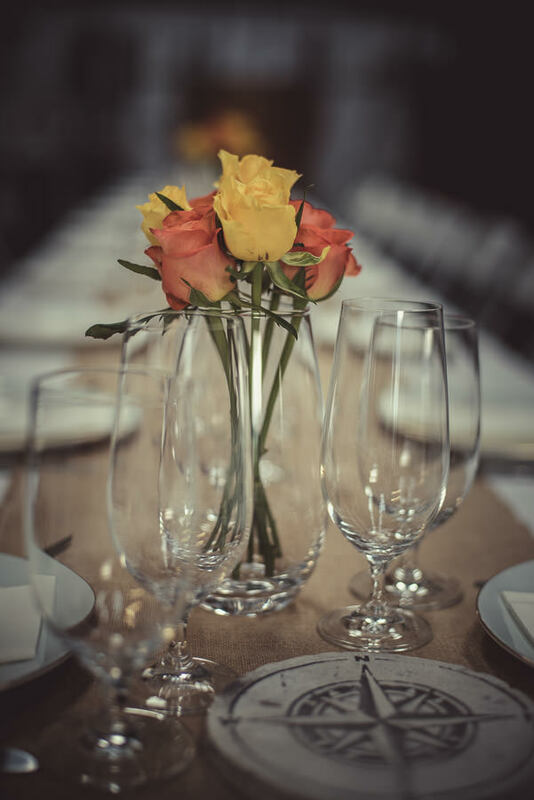 Guests were welcomed with a drink in our tasting room, before being brought through to the brewery which had been transformed for the evening into a fine dining space with white linen tablecloths contrasting with fermenters and brewkits. Fine dining in an industrial unit – table waiting for guests. 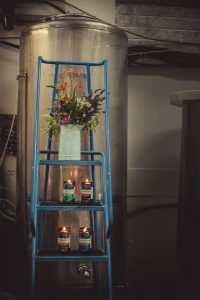 Bottles repurposed into candle holders. 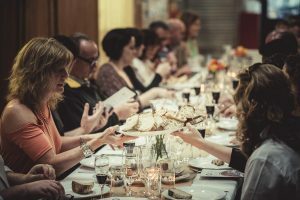 The menu for the Long Table Dinner showcased the best of the region, with many of the producers featured part of the newly launched Waterford Way food trail. 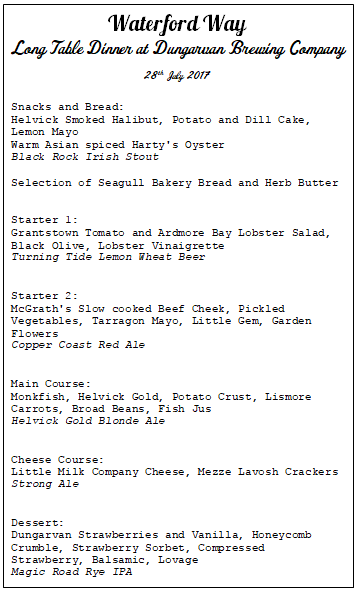 Using as many of these producers as possible, Shane put together a sumptuous menu which thrilled all the diners. 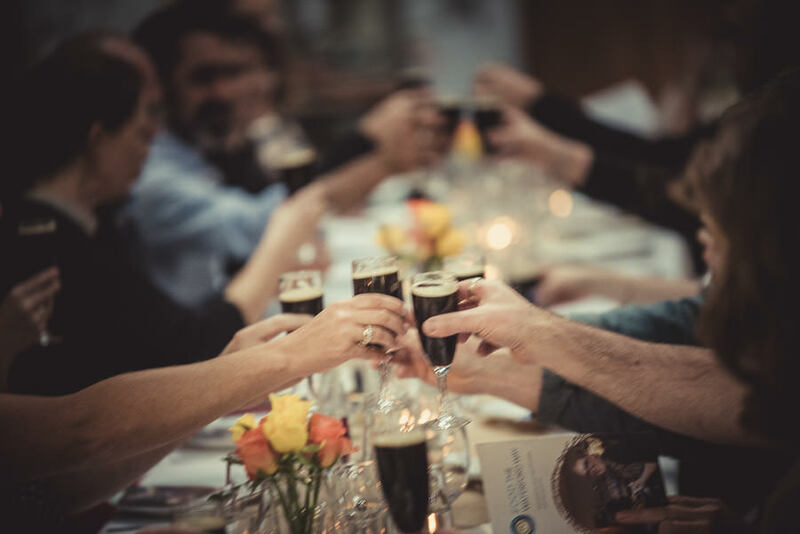 Each course was paired with a Dungarvan Brewing Company beer, with head brewer Cormac talking diners through the beers and the selection. 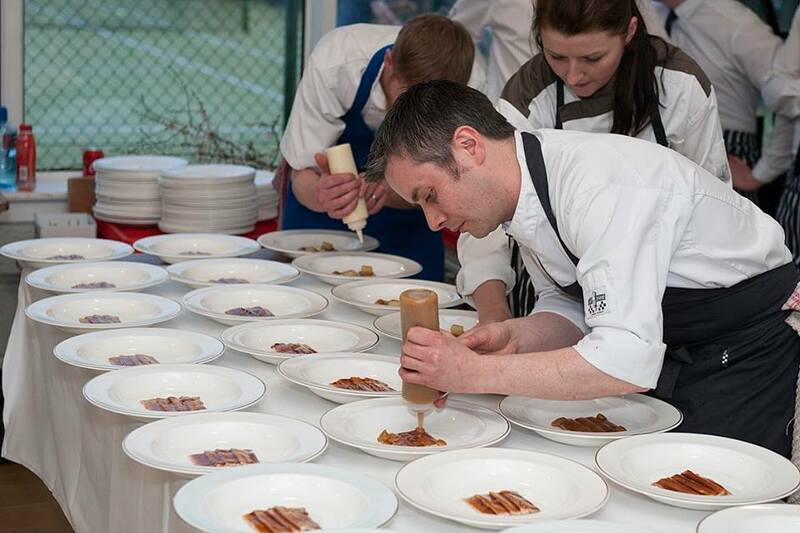 Each course was paired with a Dungarvan beer. 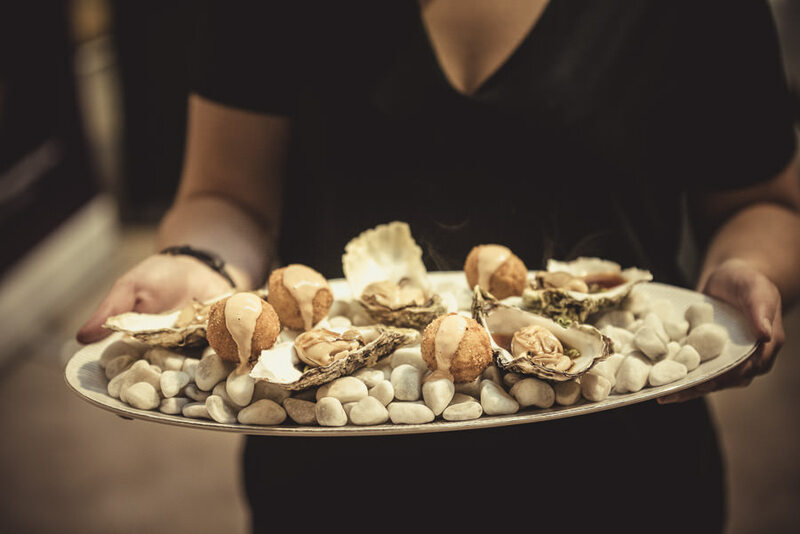 First course of Harty’s Oysters and Helvick Smoked Halibut, Potato and Dill Cake is served. Convivial atmosphere, friends old and new. In all, it was a superb night and a long time goal of ours met here at the brewery. We look forward to doing it all again soon, and would like to extend a huge thanks to our diners who put their faith in us and came along to this crazy idea we had, to Shane for producing the most magnificent feast which absolutely astounded the guests, Jack for his assistance with Shane, Leeanne for creating the amazing atmosphere and serving on the night, all the local producers who got behind the event and provided ingredients and of course Pawel for coming along to photograph the night and giving us these amazing images. Join us for our next dining event on Saturday 19th August, a middle eastern feast with our friends at Mezze. Quick update on what we’ll be up to for the rest of the month! 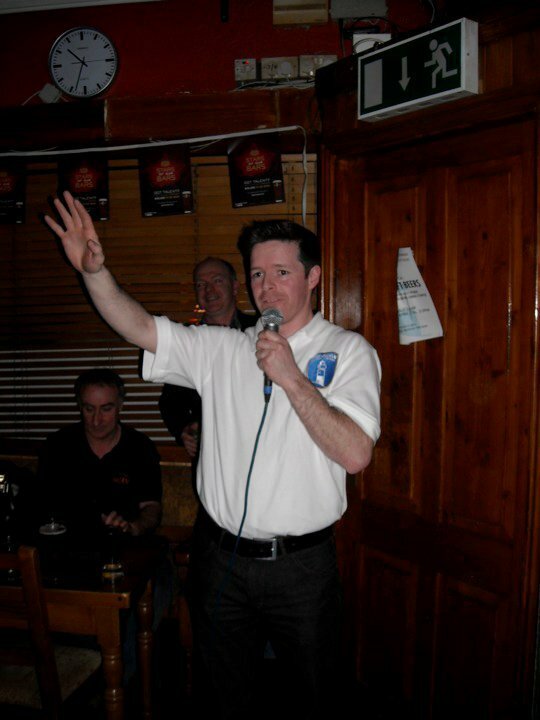 Thursday 27th – Dungarvan Show. Claire will be doing a talk and tasting session in the Waterford Way food tent at 12pm. 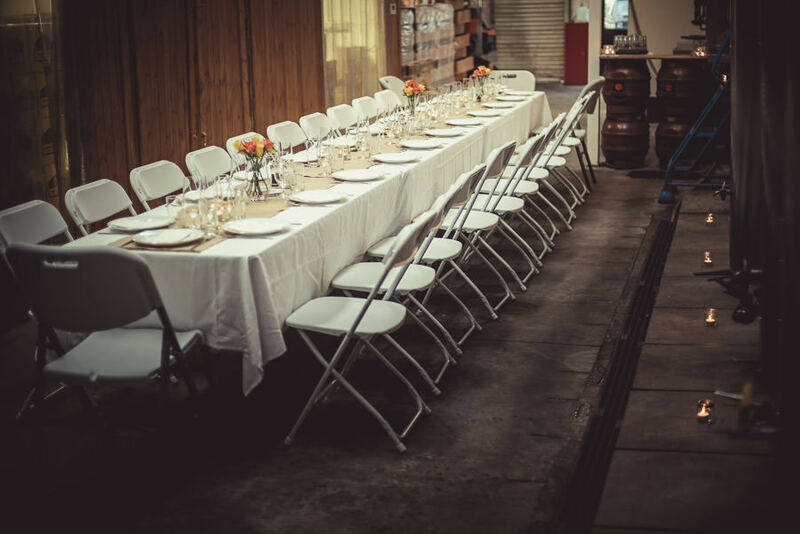 Friday 28th – Long Table Dinner at the brewery. From the very beginning, our mission has always been to brew distinctive, quality beers. Through continued exploration and innovation we have decided to release a selected number of limited edition special brews. While we continue to brew our core range and seasonals on a day to day basis, the fun part is in trying out new recipes, playing around with flavours and tinkering with the pilot kit. Usually the results of these brews are released as one off casks or kegs, often coinciding with one festival or another. Until now these one offs haven’t made their way into bottles, so we’ve decided to do something about that and roll out more one off, small batch releases. To kick things off, we’ve sent out a batch of what we’ve decided to call a Thai Wit. This is a classic wit beer, brewed with Irish wheat malt, Irish barley malt and Munich malt, which has been flavoured with some Thai-inspired ingredients, namely palm sugar, kaffir lime leaves, coriander, galangal, cardamom seeds and lemongrass. Tasting notes: This pours a dark golden colour, with the classic pillowy Wit head. 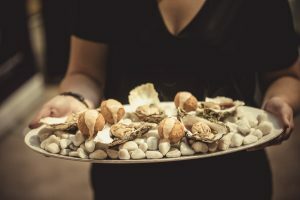 The medium body has a chewy mix of dryness and sweetness, which is lifted by the freshness of the lime and lemongrass flavours, while the initial coriander and cardamom notes give way to a lingering heat. Food Pairing: Obviously something Thai would work great with the flavours here, but this beer would stand up to more robust dishes and stronger flavoured meats. Try a Massaman curry (our favourite is from Little Thai Kitchen) with beef or duck, or alternatively move towards a beef stroganoff or hearty venison stew. Cheese Pairing: Again, stronger flavours would work great here such as a good vintage cheddar which the maltiness of the beer works well with while the spice kick lifts the whole pairing. Ah Summer! 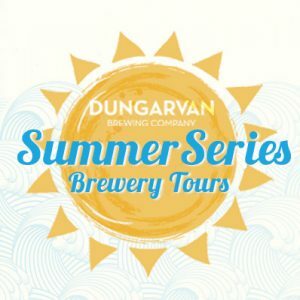 Ok, we’re not having the greatest one weather-wise here this year but at least there are some constants, like our Summer Series brewery tours and tasting sessions! 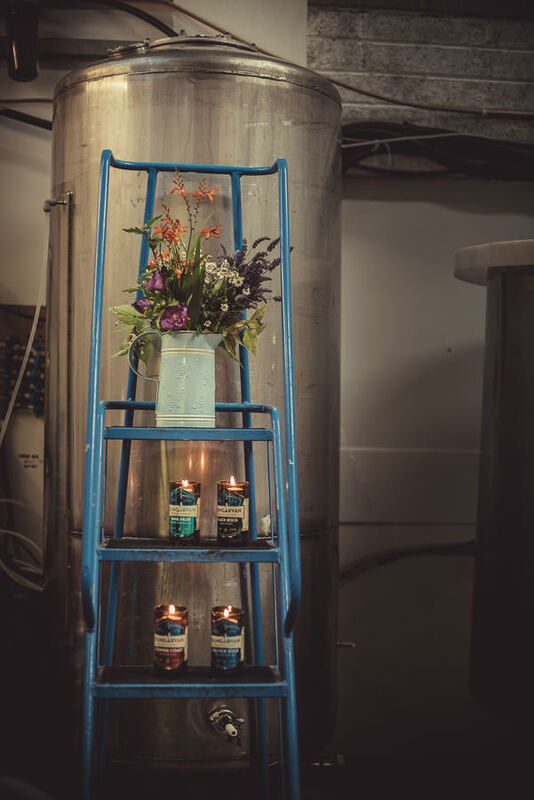 Once again this year we are running tour and tasting sessions on Friday evenings, kicking things off at 5pm with a brewery tour and following this with a tasting of our beers and some food pairings. Sessions last approx. 90 minutes and are a relaxed, fun session and a great way to kick off the weekend. For an idea of what to expect on our Summer Series, have a read about Billy Lyon’s visit with us in 2014 on his blog corkbilly.com. Contact us for more info, dates available and to book your spot on one of our Friday evening sessions, or book for yourself or someone else via our online shop. Mine Head on a trip to the beach. For visits to the brewery outside of these sessions please contact us in advance and we will do our best to accommodate you. Be advised that summer is a busy time for us with production and visitors so advance notice is required. We have more information about visiting the brewery on our Brewery Tours page. 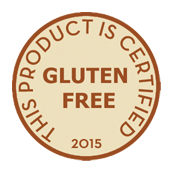 We have been asked many times about brewing a gluten free beer, but up until recently we were not happy to do so, as it would mean either brewing with a gluten-free grain such as sourghum or chemically altering the beer, which is not something we are willing or happy to do. However, new brewing products have come available that can break down the gluten in the beer, and after a bit of trialling and experimentation our head brewer Cormac decided to make this year’s Comeragh Challenger gluten free. 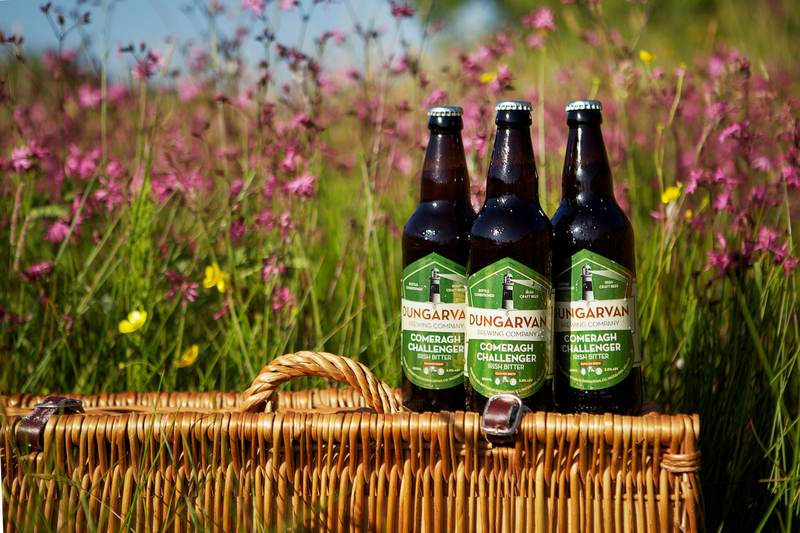 Comeragh Challenger is our regular summer seasonal since it was first released in 2012 and is an always popular one. 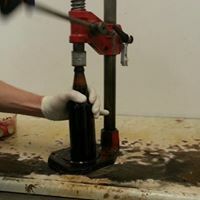 After a few delays and hiccups along the way, the beer was brewed and bottles from each batch have been tested and certified – the results of the analysis are showing a gluten content of <10ppm (far below the threshold of <20ppm for a food to be considered Gluten Free). 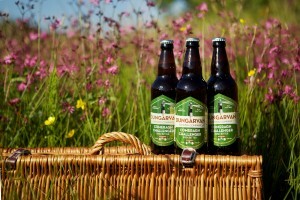 All batches brewed this year so far have been tested, so any Comeragh Challenger currently on the market is gluten free. We released some of the bottles before receiving certification but you can rest assured that even if the bottle isn’t marked as such, all stock out there is certified. Cheers!